Unfortunately, the savegame you sent me (SaveGame47.sav) doesn't work, there's a runtime error: "Assertion Failure [Line 2492 in file .\Strategic Movement.cpp].". (An even older one comes from day 29 (this is day 34) so I guess it's too old and not interesting). Thanks for you ongoing efforts! Hmm. That didn't help, the waypoints were already corrupted. Nevertheless.. This exe somewhat fixes that - if a group wants to move and has corrupted waypoints, we now properly delete them and stop movement, instead of travelling to the Eye of Terror and crashing the game. This isn't an 'official release' - mostly because I have better stuff to do than maintain an increasingly outdated branch for the pure sake of it - but you can treat it as such. On another note, the savegame from day 29 would actually be interesting. Seems like it's working. You're amazing. I owe you one! Sorry if this has been mentioned before, I don't visit this part of the forums much but I noticed in Vengeance: Reloaded (and understand others have noted in r7609 v1.13 in which it shares code base with) mercs mentioning they have found nothing when using med or first aid kits? I've have noticed on two occasions now that when you grab one of these items during combat to heal yourself, it plays the 'snatching' sound effect and the merc says 'nothing' when using these, as if they are trying to pick something off of the ground. Healing works as it should, but just sounds strange when these effects and speech are heard. Has anyone else reported this and know if it's been fixed? I used a 7879 exe for the test. Hmm, Ed Mortimer reported the same issue when I flagged it at the Vengeance closed forum, but got the impression it was happening in r7609 of v1.13. I take it the 7879 is a later revision? So far I've noticed it with Wolf and Houston, but I think they were the only mercs patching up at the time. NOTE: I'm using polish JA2 version. Music is turned on again. NOTE: This works with other 3 options of sounds as well. I tried to find if bug was reported, but I've seen none, so I hope it wasn't. I can't reproduce that bug with the latest development version of 1.13. I tried to reproduce the bug with English version and all works fine. Hi guys, I've started playing 1.13 mod AGAIN )(this time it's version 7609) and got some problems (unclarities) in the first minutes of playing. 1. My IMP merc has a Sniper (+Stealthy) trait and MP5 as a starting weapon (+2x scope). The wierd thing is that enhanced description box says that the maximum allowed aiming levels of the weapon are 3 -1 = 2. I'm confused. Does the Sniper trait reduce aiming levels for weapons other than rifle-type? Because all my AIM mercs have 3 +1 = 4 with this weapon. Can't get it. Where is the -1/+1 coming from and btw, shouldn't SMG's be restricted to only 3 aim levels even with the scope??? However, what is strange is that I got 3 aim clicks in both cases so maybe a display bug? 2. I hired Igor. He has Hunter skill and some shotgun (I think it's Benelli). Now... this skill doesn't seem to work. He doesn't get fire/pump AP cost reduction from Hunter skill. I have normal AP costs when shooting/reloading and also, enhanced description box shows no bonuses. 3. The good old feature "reveal all items after combat ends" doesn't work. I set it to true but still have to manually reveal items (or at least it happened in my first Omerta fight). I've never had problems with this in older versions. 4. When i click on a key panel (inventory), screen goes completely black (only characters are displayed) and I have to move mouse a bit to "refresh it". It bugs me because I was very eager to play it again (it's been 2+ years and I thought i will be be more polished) but getting this after like 20 minutes of playing almost killed my interest. Btw, I have basic JA2(GOG) + full 7435 + update 7609. Also, Win 7 Home + WinXP (SP3) compatibility, run as an administrator, desktop composition + DPI scaling + visual themes - all three disabled. 1. Looks like you are playing with the New Chance to Hit system (NCTH). Reduced aim levels from the Sniper trait are actually a good thing because you will reach maximum possible aim earlier than others and therefore spend less time aiming. So when a gun usually has 3 + 1 (for a folding stock for example) = 4 your sniper has 3 + 1 - 2 (from two sniper trait levels) = 2. 2. I don't know about such hunter problem in 7906. I can only say that it works fine in the current build. We are at revision 8001 at the moment and nobody is fixing bugs anymore for the old stable version. If you want to try out a newer development build you should go here. 3. I haven't had this problem so far. 4. Had this problem too a few times but wasn't able to reliably reproduce it for debugging. If you have a 100% sure method to reproduce it please tell us. I'm not sure if I understand. Does it mean that lower = better? Doesn't the game tooltip say the opposite? Also, the Sniper trait tooltip says "Adds 2 aim click levels for rifle-type weapons". Btw, I'm playing with OCTH. Ok. I'll try it. I'll also try to test it more in depth. Maybe that I overlooked something. Anyway, thanks for reply. In NCTH lower indeed equals better. If you are playing with OCTH then you are the victim of a display bug in EDB that was fixed in r7864. With OCTH higher is better. Any ideas how to fix it? Thanks in advance! Backpack (&other LBE/ILBE) contents disapear if the backpack holding stuff is placed within another backpack. It doesn't happen at first . . . but over time it starts, and when it starts it continues all the time. The game seems to lose trackof the contents when placed within a pocket inside another pocket. I know of no fix for it. But this time i had only crowbar & head inside. Still will miss this ones? I appear to have a save game corruption problem where every save after an certain point becomes unusable due to runtime errors. However this point is completely random. The first time I think was because I turned on zombies in the hospital. Had all mercs die, then it auto saved. After that all files associated with that campaign (save for two I made on day 11) where unable to load. After great anger I started a new campaign after putting the broken files in a separate folder. I have played my current campaign until tonight when I left my computer on for a few hours while in game. I had noticed some strange graphics glitches like gas masks flashing over merc portraits on the map, and some of carps reports coming in with unrelated dialogue different from the subtitles. Igor was then killed in a auto resolve battle so I decided to load a save from day 93 at 12:00. The load screen was messed up and froze so I had to close the program with task manager. After starting the game again I tried to load the day 93 save but it failed and gave me a runtime error. Then I tried to load all my auto saves and my quick save ranging from day 90 to day 93. All failed. I tried loading my closest latest saves until one of my manual save, on day 53, managed to launch. I do have a picture of the error message if you need it but I don't know how to post it. I've already copied the new broken files to my bugged folder for safe keeping in case anyone needs them. I'm hoping I can get this fixed soon. Thanks in advance. Usually a result of antivirus software. Try disabling antivirus or make exception rule for JA2 folder. Also check that ja2 is not installed in any system protected folder like Program Files. I'll check my anti virus. The mod is installed in a separate folder from my program files. 2. Are the values of the minor trait "scouting" correct by being absolute values (see below) or should they be relative values like most of the other major and minor traits are being descriped? -20 tunnel vision with binoculars or scopes separated from weapons"
3. Does the word "check" in the attributes of the minor trait "demolitions" (see below) describe any special "check"-action or is this just a rather confusing phrasing for the action of attaching detonators and planting/removing bombs? +50% to planting/removing bombs check"
This "check" is an internal test if the merc is able to perform the task. If he fails he will damage the detonator (attaching detonators) or blow himself up (planting/removing bombs). Just found out that this backpack bug will occur even if you carry backpacks with the characters hands -- and never put a full backpack into another backpack. Very frustrating as once it begins, every time you drop a backpack it loses it's contents. Just found what might be a workaround to the backpack bug -- it only seems to happen if you use the hotkey to 'drop all backpacks'. I just had a battle where I manually took off and dropped each backpack and when I picked them back up again (manually, and through the inventory screen -- not by hotkey), they all still had their contents. This after three times having the same squad lose all their backpack contents through the drop all hot key in previous battles. Due to the creation of different tables about JA2 1.13, I've encountered some errors and inconsistencies. 1. The minor trait "scouting" misses the "%" behind the numbers. 2. The sniper rifle "VSSK Vychlop" has been named wrong. The correct name is "VSSK Vykhlop". "Vychlop" as it is named as of now was the name of a development program. 3. Not really a bug but worth to mention: The caliber "9mm Metal Storm" is the only caliber which is missing a boxed version. 4. The flashlight has a double entry with exact the same values. 5. The 17 different grenade launchers don't have a caliber. Even monster spit has a caliber ("Monster"). 6. The 17 different grenade launchers don't have a type and are sub-ordered to the "rifle" class. Shouldn't there be enough grenade launchers for at least a sub-type? 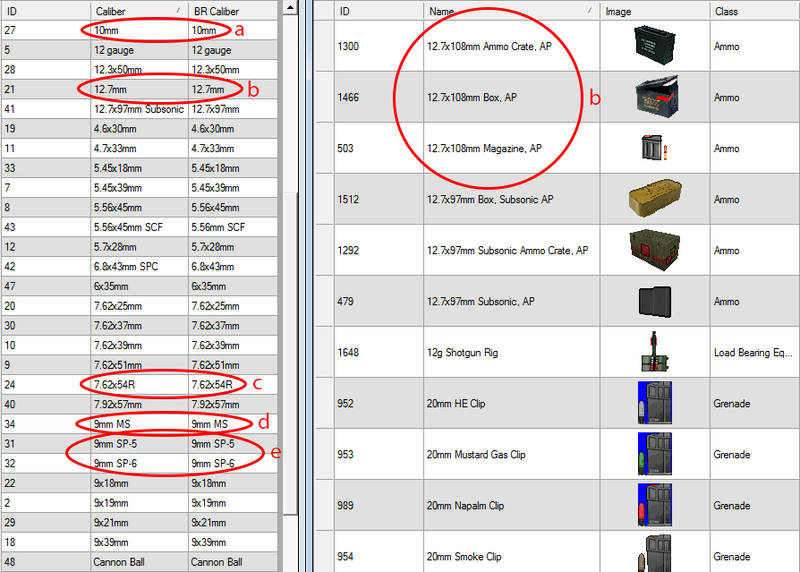 c. "7.62x54R" = "7.62x54 mm R"
d. "9mm MS" = I couldn't find anything on the second dimension for the Metal Storm-ammunition. e. "9mm SP-5" & "9mm SP-6" = "9x39mm SP-5" & "9x39mm SP-6"
8. Due to consistency either "modification" or "modifier" should be used (various occasions). 4) One of them is ON, the other OFF. Technical reasons. 5) Launchers handle their ammo differently, assigning a caliber would just lead to weirdness. 2. Fixed in GameDir r2281. 6. Not sure, moving that around can have odd consequences. Hmm. 8. Seems to have already been fixed in the trunk. I'm not sure this is the right place but I'd like to report a audio file priority bug when adding additional sound files to the game. On Vengeance we're using additional Ogg file in battlesounds but they get superseded by corresponding files in the original Vanilla SLF. So for example if there is a wav file in the the old SLF for profile 73 the game will play the incorrect wav file from Vanilla rather than our new Oggs in the Battlesounds folder as Wav's seem to get preference over Oggs. Can this be changed? // OK, build file and play! But would Shepard have a sound file in the Vanilla SLF? Or is she using a new profile? Some of the Vengeance team have looked at this, but I'd need them to explain how they got around it. Thanks for looking though. Could it be something in the VFS config file maybe? Flugente gave Shepard ID 254, so no, there wouldn't be a vanilla sound file for her. Points 1-6 are all according to the speech files. 3. "an" instead of "his"
4. "only here" instead of "here only"
7. Whenever a merc gets the order to bandage himself out of a prone stance, he gets into a crouch stance and right before bandaging himself, he plays the speech file, which usually plays when you click on an empty tile with the hand cursor (e. g. "Nothing!"). 8. Whenever a game is quickloaded during the enemy's turn, it very often crashes to a blackscreen during the transfer from strategic to tactical screen. 9. Whenever the hotkey combination "CTRL" + "LEFT ARROW" / "RIGHT ARROW" is being used to rearrange the mercs' portraits, the game very often crashes right to the desktop. 10. Not really a bug but worth to mention: On the tactical screen the active merc's portrait is being highlighted with a golden frame, but whenever more than one merc is being selected, only one of them shows the highlighted frame. EDIT: IGNORE THIS -- upon further investigation that is not the situation at all. The problem is that the new speech files do not have entries for all the slots that the vanilla files do. In the latest Arulco Vacations I moved all AV files to the VFS structure -- now I am having the problem Hawkeye pointed out. All OGG files in the AV VFS file folder are being ignored for the relevant WAV files in the DATA-1.13 or Data folders. Edit: I should also mention that all WAV files in the AV VFS folder play normally -- so the game is looking there first. But if there is an OGG file in the AV VFS folder the game ignores it and looks for the WAV file of the same name. My problem is in the SPEECH folder. On further investigation the problem seems to be that if a particular EDT file has a blank slot for a certain voicefile call, then the game looks at the files in Data-1.13 & Data to find an EDT file that has that voice slot active. So with the new Female voice sets, occasionally a Russian male voice is uttered -- particularly in the voice selection during the IMP creation process.. I have a converted elite to elite militia change his shirt back to black in front of my merc right after battle. He also cannot be commanded like a regular blue shirt. Hi, I think I discovered a bug. I just signed in in the forum to report it. I did put a backpack with things inside other mercs backpack to use the radio. When the combat finished I tried to put the backpack back in the radio operator merc but then the game crashes. The same happens if I try to put the back pack that was kept inside other backpack into other merc, the game just crashes. When I see the item details of the backpack that is inside the other backpack the content seems to be hiden and the slots look different than the item configuration. Did it happened anybody else?